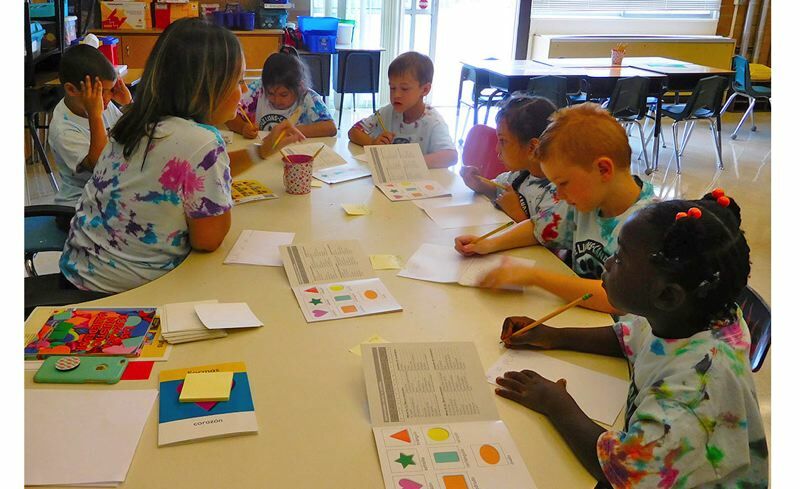 What began as a small program embedded in a traditional school for the Jennings Lodge neighborhood will this year become a magnet program serving elementary-age students across the Oregon City School District. The bilingual school operates on two small campuses, with kindergarten through second grade at Jennings Lodge Elementary and third-through-fifth grades at Candy Lane Elementary. In the Jennings Lodge/Candy Lane dual-language program, children who speak English at home and children who speak Spanish at home learn together with daily instruction in both languages. In February, the OC School Board voted to give families in Jennings Lodge's traditional English program the choice of joining the bilingual program or attending the traditional English program at Holcomb Elementary, a school located on the other side of the Clackamas River. Due to the popularity of the bilingual program, Jennings Lodge's 67 traditional English students had been reduced to only three classrooms, one class per grade level at the school, each with an average of 22 students. Meanwhile, bilingual program enrollment expanding to 202 had necessitated hiring eight bilingual teachers who each had to teach an average of 25 students. Jennings Lodge/Candy Lane Principal April Albers said the disparity in class sizes was one major issue facing the school. Another issue was the dwindling sense of community for neighborhood students seeking an education conducted solely in English. "We've struggled to provide a full and complete experience for our traditional English-speaking students because there aren't enough of them," she said. "Several families who decided to transfer to Holcomb are excited about that because there are multiple options for traditional English students." Even prior to the decision to make it a magnet school, Jennings Lodge/Candy Lane was no longer the "neighborhood school" it once was, Albers said. The campuses used to just serve what was termed "the island," a portion of OCSD in the unincorporated area near Gladstone. However, the enrollment boundaries of Jennings Lodge/Candy Lane expanded to include neighborhoods in Oregon City after OCSD officials decided to close two elementary schools in 2012. "More than half of our students came from up on the hill in the Barclay and Rivercrest area, where Holcomb was closer to being their neighborhood school," Albers said. At the Jennings Lodge campus, most of the instruction is conducted in Spanish, but by third grade at Candy Lane, the school day is half in English and half in Spanish. In order to graduate from the fifth grade, students in the program must be able to complete high-level academic tasks and hold fluent conversations in both languages. "We made this program schoolwide because interest in bilingual education has expanded dramatically," Albers said. "We get calls every day from families who want this experience for their child." Albers said she's heard from many parents who purchased houses in Jennings Lodge to guarantee first preference in the bilingual program. Jennings Lodge resident Mitra Anoushiravani is the parent of a soon-to-be first-grader who is happy with the education her child received as a kindergartner in Jennings Lodge. She agreed that the location of the bilingual program has had an effect on local real estate. "When we found out that we had priority access to dual-immersion program, we were thrilled," she said. "I do know of at least one of my neighbors who specifically purchased their home here for the program." Anoushiravani is looking forward to enrolling her daughters, age 4 and 8 months, in the program as well. "There's some compelling research out there showing the brain benefits of a bilingual education," she said. "Our family values multiculturalism and diversity, so it's exciting to have our son and, ultimately, his two little sisters go to a school where that's encouraged." Jennings Lodge resident Rita Tolonen, whose grandchild is moving to Holcomb, said she doesn't like using the term "traditional English program," because it sounds like a pejorative term, like calling someone "Amish" just for being resistant to adopting new technology. Tolonen was disappointed that the After the Bell program is moving back to Candy Lane after being located at Jennings Lodge the past few years. The district had offered Jennings Lodge students who are moving to Holcomb the option of continuing to attend after-school programs in their neighborhood, but Tolonen said the Candy Lane campus across McLoughlin Boulevard is not as convenient as Jennings Lodge for her family. Albers said there has always been one After the Bell program for Jennings Lodge/Candy Lane, which saves on staffing costs and puts siblings together in one building at the end of the day, making pickup easier for families. "Based on a safety review of after-hours building usage, we are moving After the Bell back to Candy Lane again this fall," Albers said. "It will continue to serve students who attend Jennings Lodge and Candy Lane, as well as any students attending Holcomb whose families live in our immediate neighborhood." Students who will be in the fourth or fifth grade of the traditional English program at Candy Lane will be grandfathered into the traditional program, so the last traditional English class will graduate out of Candy Lane in the spring of 2020. But traditional English students at Jennings Lodge had a choice to make for the beginning of this school year. Most of the 67 students who were in the traditional English program at Jennings Lodge during the last school year will be transitioning to Holcomb. Families of seven of those students chose to move to the bilingual program, and about 15 who were mostly Jennings Lodge residents applied to transfer to the Gladstone School District, Albers said. "Parents usually make a thoughtful choice when they enter their children into a kindergarten or first-grade program, so that wasn't surprising," Albers said. "I'm never taken aback when parents have concerns, because they are their child's best advocate, and I would expect nothing less of them." To ease the transition for about 45 former Jennings Lodge students, Holcomb Principal Kelli Rhea's staff has planned special activities to help students make new friends and get acquainted with their new school. "We are always amazed at how adaptable children are, even if making a big transition like changing schools," Rhea said. The district's bilingual education program continues at Gardiner Middle School. The goal is to eventually expand the program at Oregon City High School so more students can earn the Oregon Seal of Biliteracy at graduation. "I am always excited to see the sense of accomplishment and pride in students that comes from mastering something challenging," Albers said. "Learning a new language is hard, but it builds great problem-solving skills and opens a world of possibilities for travel and careers."